Although 1 was missing it's seppa (spacer), it doesn't matter. I've spent 3x as much on just one shinia. The BOGO deal was too hard to pass up; 2 for $20! Come on! 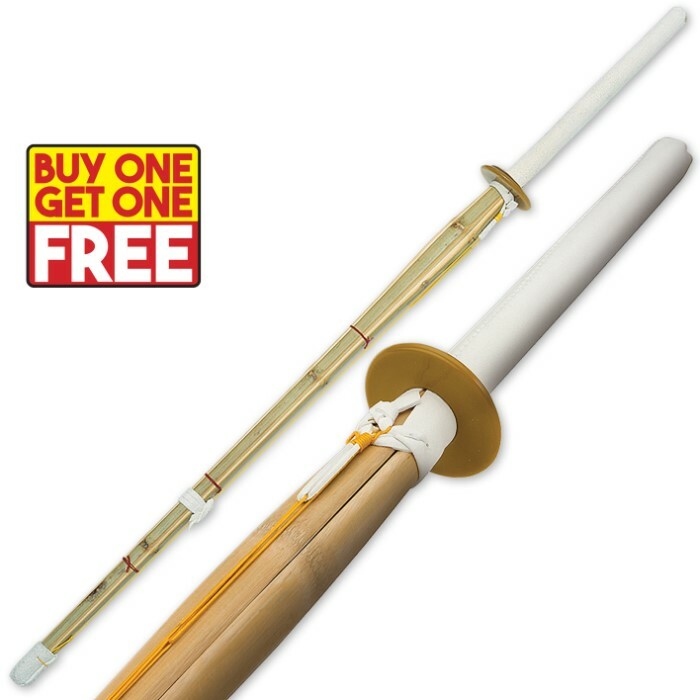 Theses are high quality training shinai. Can't wait to see how they hold up in my next tournament. These are pretty good Kendo swords. Got them for Christmas and they've held up just fine. The red ribbon things do come off after a little bit of use but they are just decoration anyway. The leather grips are good and don't show any signs of coming off after over a year of use. They do hurt when you get hit but don't be stupid with them and you'll be fine if you can take some minor bruises. And the BOGO deal is great too of course. I run a casual Kendo group with my friends and we often spar with these for at least 3 hours straight and have not had a single problem with the bamboo, the strings do come off but duck tape can fix that easily. They are strong and hurt when you get hit if you are not wearing protective gear. Overall, good training sword for an even better price. Worth the price, but the little red strings fell apart after the 1st use. I would hope they upgrade and us leather straps so they don't fall apart. I bought this set and was very happy. One of the hand guards were missing, I called customer service and the gentlemen I talked to went out of his way to find a replacement. The swords are solid and a great practice tool. For the price they are pretty good. Me and my brother like to use these to spar but after a couple of harsh rounds the swords began to splinter and fall apart. To be fair we were hitting pretty hard and you do get what you pay for. I purchased one for myself and one for my friend so we could sword-spar but actually be able to block. Everything seems to hold up fine, but I noticed for both of our sticks after awhile the binding starts getting loose (I think a string wrapping around broke off). A single layer of duct tape wrapped around that area made it nice and tight and we got to clacking in no time. These pack a whallop, so I don't recommend full-contact unless you're like me and my friend and want to do sword training the old-fashioned way where you pay for carelessness. In competetion they make you wear light armor, but that crap is expensive. If you can get these for BOGO, you're looking at an amazing price. Most retailers try to get 25.00 out of you. It good for some one looking to basic kendo or sword fighting. I have used both for months and have not had a problem.